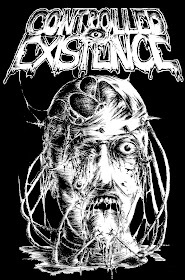 CONTROLLED EXISTENCE: ALEA IACTA EST / CONTROLLED EXISTENCE split 7"EP je vonku!!! ALEA IACTA EST / CONTROLLED EXISTENCE split 7"EP je vonku!!! V týchto dňoch konečne uzrel svetlo sveta náš split 7"EP so slovenskou kapelou Alea Iacta Est. K dispozícii je 425 kusov čierneho vinylu s čierno-bielym obalom a 100 limitovaných kusov modrého vinylu s modrým obalom a nálepkou. Cena 100kč/4éčka. Objednávky prosím posielajte emailom na adresu controlledexistence@seznam.cz v Čechách a keby mal záujem niekto zo Slovenska, lepšie bude kontaktovať kapelu Alea Iacta Est na emailovej adrese broccoli_and_eggs@hotmail.com. Za podporu vopred veľké D Í K Y. During the last days our split 7"EP with slovakian band Alea Iacta Est ,,was born´´. There are 425 copies of black vinyl with black/white cover available and also there is a limited edition of 100 copies of blue vinyl with black/blue cover and sticker inside. The price is 100kč or 4€. Please, send your orders by email to the following email address controlledexistence@seznam.cz in the Czech Republic and in case there will be someone interested from Slovakia, it would be better to contact the band Alea Iacta Est on the following address broccoli_and_eggs@hotmail.com. T H A N K S for your support in advance.